As we approach the end of the holiday season, we not only are entering into the typical uncharted territory that every New Year brings, but are also soon approaching the 75th anniversary of the end of World War II, which anniversary we’ll see in 2020. The Second World War was not simply another war in the history of nation states vying for land and power, it was the bloodiest conflict in the entire history of the human race. Unprecedented destruction claimed the lives of almost one hundred million people, mostly across China, Russia and continental Europe. While World War I was frequently referred to as “The Great War” or the “War to End all Wars,” World War II promptly stole that title away from its predecessor with unbridled territorial expansion and extermination campaigns not seen since Genghis Khan and Alexander the Great conquered the harsh desert steppes of mainland Asia. This conflict has of course become particularly commercialized in the ahistorical cultural vacuum we have inhabited in the United States since the fall of the Soviet Union in 1991. Millennial Americans’ consumerist attitudes combined with digital advancements in technology have allowed for mass commercialization of the horrors of World War II with a giant slew of video games, movies and television shows covering the course of the war. While a scant few of these mass media productions like publisher Activision’s 2008 video game Call of Duty: World at War or the 2007 Austrian film The Counterfeiters are predominantly accurate and follow the general historical outline of the war, most others promote a central lie in regards to American involvement in World War II. in the vein of Spielberg’s landmark 1998 film Saving Private Ryan and video games titles like Activision’s 2017 Call of Duty: WW2. cant prominence in our popular culture, however, we should not ignore the plain facts right in front of us. 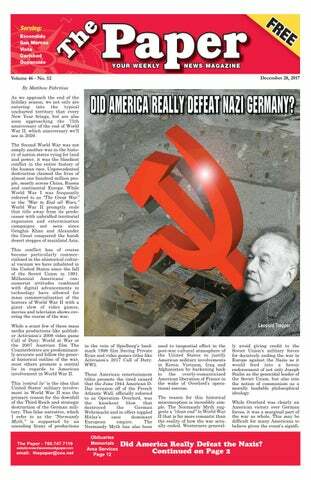 The scholastic consensus from historical experts like Earl Ziemke, John Erickson, Alan Clark and Antony Beevor is overwhelmingly clear that the Soviet Red Army primarily defeated the German Wehrmacht. Give Us This Day Our Daily Chuckle This week, a compendium of wit, wisdom and neat stuff you can tell at parties. Enjoy! The Holidays are Here! Twas the night before Christmas at Rock Away Rest, and all of us seniors were looking our best. Our glasses, how sparkly, our wrinkles, how merry; Our punchbowl held prune juice plus three drops of sherry. United Kingdom, United States and partisan movements in Nazi-occupied Europe accounted for a mere 15-20 percent of German infantry casualties. While the names of RussoGermanic battles like Stalingrad, Leningrad, Kursk and Seelow Heights are not as well known by the American public as say Normandy or Iwo Jima, they were undoubtedly the most important battles of the Second World War; as they resulted in the highest casualties for German military personnel. By the end of February 1943, two years after Hitler’s initial invasion of the Soviet Union in June of 1941, German forces in Russia were in full retreat back to Berlin with the Soviet Red Army in hot pursuit after the German 6th Army’s shocking defeat at the Battle of Stalingrad. Hitler’s top veteran general and commander of the 6th Army, Friedrich Paulus, had surrendered to the Soviet Red Army after a year of failing to take Stalin’s namesake city on the Volga River. He was ultimately saved from the gallows via treasonous collaboration with the Soviet NKVD Intelligence Service, betraying German troop locations and military movements along with other valuable logistical information. However, Paulus and his 6th Reflecting our candle's magnificent glow. Our supper so festive (the joy wouldn't stop) Was creamy warm oatmeal with sprinkles on top. Our salad was Jell-O, so jiggly and great, Then puree of fruitcake was spooned on each plate. The social director then had us play games, Like "Where Are You Living?" and "What Are Your Names?" And so ends our Christmas at RockAway Rest. ‘fore long you'll be with us, We wish you the best! Then out on the porch there arose quite a clatter (But we are so deaf that it just didn't matter). A strange little fellow flew in through the door, Then tripped on the sill and fell flat on the floor. ‘Twas just our director, all togged out in red. He jiggled and chuckled and patted each head. We knew from the way that he strutted and jived Our social security cheques had arrived. We sang (how we sang) in our monotone croak, ‘Til the clock tinkled out its soft eightp.m. stroke. And soon we were snuggling deep in our beds. When it is proven true, what can you say? Now, as if everything else wasn't bad enough, we find out that beer isn't good for us? Beer contains female hormones! Yes, that's right, FEMALE hormones! Last month, Montreal University scientists released the results of a recent analysis that revealed the presence of female hormones in beer. The theory is that Beer contains female hormones (hops contain Phytoestrogens) and that by drinking enough beer, men turn into women. Old Grandfather Cooper was feeling his oats Proclaiming that reindeer were nothing but goats. Our resident wand'rer was tied to her chair, In hopes that at bedtime she still would be there. Security lights on the new fallen snow Made outdoors seem noon to the old folks below. craft bombing runs. By the end of the ordeal, over 1,000,000 Leningraders had been killed as a result of the intense Trojanstyle siege. The Soviet Red Army sniper turned U.S. citizen Kyra Petrovsakya attests to the conditions in her autobiography Shurik, which details her maternal mission to protect a young Russian boy from the German invaders. To test the theory, 100 men each drank 8 large drafts of beer within a one (1) hour period. Let me tell you friends that one simple spelling mistake--even a typo--can make your life hell. It was then observed that 100% of the test subjects, yes, 100% of all these men: 1) Argued - over nothing. 2) Refused - to apologize when obviously wrong. 3) Gained - weight. 4) Talked - excessively without making sense. 5) Became - overly emotional. 6) Couldn't - drive. 7) Failed - to think rationally, and 8) Had - to sit down to pee. No further testing was considered necessary. ••••• A couple was invited to a swanky costume party. this logistical roadblock was simple. Send thousands of human sappers (political dissidents branded as “enemies of the people”) out to detonate the land mines by running across the mine fields so that the Soviet tanks could advance westward and eliminate the artillery positions with their cannons. If you refuse to run out, we shoot you for cowardice. It was a fairly simple logistical setup with all things considered. ment. Participants are encouraged to bring samples of their current writing projects. Adult Winter Crafts: Watercolor Painting with Cotton Swabs on Tuesday, January 6, from 10:30am-12noon. Bring out your inner artist by using cotton swabs and watercolors to create a unique art piece. The 2nd Tuesday Book Club will meet January 9th from 6:00–7:30pm, for a discussion of H is for Hawk. Helen Macdonald presents an award-winning and gorgeously written account of how she managed her grief at losing her father. A naturalist and falconer, Macdonald trains a bird of prey to hunt and finds parallels to her own experiences in a beautiful book ripe for discussion. 2nd Saturday Concert Series Presents Louis Landon for all ages on Saturday, January 13, from 3:00--4:30pm. Steinway Artist Louis Landon, the self-described Pianist for Peace, aspires to create a more loving and peaceful world by writing, recording, and performing music from the heart. Landon will perform a solo piano concert of his original compositions. Rincon Literario, Bilingual Book Club is discussing Isabel Allende’s newest novel Mas alla del inviemo/In the Midst of Winter in both English and Spanish on Saturday, January 27, from 10:30–11:45am. All library programs are free, open to the public, and generously sponsored by Friends of the Library, located at 239 S. Kalmia Street in downtown Escondido. For more information about January programs, visit library.escondido.org or contact Senior Librarian Monica Barrette at mbarrette@escondido.org or 760-839-4836. East Valley Community Center Holiday Hours - Due to the City of Escondido's observance of the holidays as well as annual maintenance to the gym floors, the East Valley Community Center, located at 2245 East Valley Parkway, will be closed through Monday, January 1st. The Community Center will reopen on Tuesday, January 2nd, for normal business hours. For information call 760.839.4382 or visit the website at www.recreation.escondido.org. Germany. As described by Pulitzer Prize-winning American writer John Toland in his 1970 book The Rising Sun, the U.S. battles at Iwo Jima (codenamed Operation Iceberg) and Okinawa (codenamed Operation Detachment) were absolutely crucial in stopping further Japanese expansion into mainland Asia and potential advances into Soviet Siberia. Over 65,000 American soldiers died over the course of four years in the Pacific Theater during the various island-hopping campaigns that took place after the attack on Pearl Harbor in December of 1941.
ers of classical music interested in learning to listen to, appreciate, and enjoy classical music. Presentations include state-of-theart audio and visual equipment, giving the attendee an unforgettable “front row seat in the auditorium” experience. Held at the Gloria McClellan Center at 1400 Vale Terrace Drive in Vista on January 3 from 1:00–3:15pm. Free and no registration required! Hosted by Hank Presutti. For information, call 760.643.5288 or email luigibeethoven@cox.net. Center to Hold A Happy New Year Luncheon - The Gloria McClellan Center will hold a “Happy New Year Luncheon” on Thursday, January 4th, at 12 noon, at 1400 Vale Terrace Drive in Vista. Entertainment by the Script In-Hand Players” begins at 11:00am. Lunch includes baked salmon with creamy dill sauce, rice pilaf, Brussels sprouts, and spiced peaches; alternate menu is split pea soup, egg salad on romaine, carrots sticks, a roll, and spiced peaches. Sparkling cider and a New Year’s toast! Suggested donation is $4 for those 60 and older; and an $8 charge for those younger than 60. Reserve by 1:00pm one day prior at 760.643.5288. Grandmothers Club Meeting/Potluck Luncheon - The Grandmothers Club will hold a meeting and potluck luncheon at noon January 4th at the Park Avenue Community Center, 210 E. Park Avenue, Escondido. Attendees are encouraged to bring a dish to share plus their own eating utensils. Individuals interested in attending do not need to be grandmothers to join. Call Elda at 760-746-0215 or Kathy 818219-3040. Gilles Perrault tracked down the last of these Soviet espionage operatives, their Gestapo opponents and other tangential associates, eventually detailing their stories in his 1965 book, The Red Orchestra. From Perrault’s groundbreaking research, we know that the Soviets had been entirely caught off guard by the German invasion in the summer of 1941 as Stalin had been expecting an alleged anti-communist coalition of Anglo-French soldiers to invade the USSR. The exact details are incredibly complex, but in layman’s terms, Stalin expected the British to invade Northern Russia from Finland to capture Leningrad and the French to invade Soviet Azerbaijan from their colonial outpost in Syria to capture the oil fields surrounding Baku. flexibility, and strength. Cost is $65 for Vista residents, $78 for non-residents. To register, call 760.643.5281. San Marcos Hike Scheduled for January 6th – The City of San Marcos will host a hike from Las Posas Park to Blue Bird Canyon on Saturday, January 6th. This 7-mile hike will explore the 2nd San Diego Aqueduct north from Las Posas Road to Buena Creek Road, then head east along the Lake Wohlford Flume that transports water from Lake Wohlford to the Pechstein Resevoir at Blue Bird Canyon Road. There will be 580’ of elevation gain. Meet at 8:30am at Cerreo de Las Posas Park, 1387 West Borden Road, San Marcos, 92069. Point of Contact: Ron Vinluan, 760.744.9000 ext. 3535, rvinluan@san-marcos.net. Palomar Health Cooking Classes: Food As Medicine – Hope you are enjoying a beautiful holiday season. Here is an update on cooking classes that are free and open to the public during the first few months of 2018. January: Healthy Lifestyles, 9th, PMC Poway 4-5pm, Café Conference Room; 11th, PMC Escondido, 4-5pm Café Conference Room. February: Heart Health, 6th, PMC Poway, 4-5pm, Café Conference Room; 8th, PMC Escondido, 4-5pm, Café Conference Room. March: Diabetes, 6th, PMC Poway, 45pm, Café Conference Room; 8th, PMC Escondido, 4-5pm, Café Conference Room. April: Gastrointestinal Health, 3rd, PMC Poway, 4-5pm, Café Conference Room; 5th, PMC Escondido, 4-5pm, Café Conference Room. To register, visit PalomartHealth.org/Classes or call 800.628.2880. Contact Kathryn Vasaeli for questions: Kathryn.vasaeli@palomarhealth.org. over the Allied Powers. It was the perfect cover with which to fleece the Nazi authorities. What Nazi official would ever even begin to suspect a seemingly greedy French businessman awash in alcohol, cigars and women of being a working-class, European Jew working as a communist spy in the employ of Soviet Intelligence? There is a fella who lives at our house named Mr. Bumble. There are those who say he bears a remarkable resemblance to me. I disputed this but, well, you be the judge. Saturday night I locked the door to my office (my office is in my home). A 1996 Nissan Sedan, driven by the Escondido man, moved to the right shoulder, where a 2016 Nissan Sentra driven by a 65-year-old San Diego woman struck the older vehicle, causing it to catch fire, according to the CHP. Officer St. John searched Rabb’s car and found numerous mail packages. The packages, many of which were torn open Amazon boxes, appeared to have been stolen before the intended recipient could pick them up. Approximately 30 packages were recovered. The stolen items included clothing, tools, and electronics. We have identified many of the victims in this case already and are working to reunite them with their stolen property. Victims confirmed that the packages in Rabb’s car were shipped to their residence and stolen after being delivered. Rabb was arrested on his outstanding warrant and charged with P.C. 496(A)Possession of Stolen Property. A motive in this case remains paddle. I analyzed the situation for solutions. I could borrow a neighbor’s drill with an attachment for cutting out holes in doors for the installation of door knobs, expand the size of the hole as necessary, reach my hand through, bend it, and unlock the door; I could take the nuts and bolts off the window air conditioner, pull the air conditioner and then crawl through the window, and, once accessing the office, unlock the door and, not incidentally, locate the keys and wallet. I decided instead to call a locksmith..
“Yes, I am a Sabra (which means an individual born in Israel).” We had a nice but brief chat and in about five minutes he had unlocked the door and opened it. I was saved! I gave him a credit card and off he went to unlock other doors for other Mr. Bumbles. The Escondido man driving the older vehicle died, and so did an 80-year-old man and woman from San Diego, who were passengers in the newer Nissan. The driver of the newer Nissan, a 65year-old woman, was taken to a hospital with injuries that were considered moderate. A third vehicle, driven by a 38-year-old man from Huntington Park, later sideswiped one of the wrecked vehicles, but nobody was hurt. Lanes of southbound I-5 were closed for about two hours while officers investigated. The cause of the collisions, and whether drugs or alcohol were factors, had not been determined as of Tuesday morning. CHP Officers continued to investigate. that could have used that $129. I asked Dear Wifey if she’d scour the house and see if she could find my grey walking shorts that had my keys and my wallet. She looked and looked with little success. Finally, I found my sandals, went to retrieve another pair of walking shorts; I knew where a backup key to the car was located in my now-open office. As I began to leave the bedroom I looked down on the floor and there, just barely visible, under a corner of the bed, was a grey pair of walking shorts. I picked them up and heard the welcoming jingle that told me I had found my long missing car keys . . . and my wallet. Already I had begun to rue the wasted $129. But, if one hopes to qualify as a bearer of the title, Mr. Bumble, he must do something similar. It’s a rather demanding requirement of all of us Mr. Bumbles. ••••• Later that day our six year old granddaughter came over to celebrate Christmas. She had Christmas presents galore from Grandma and Grandpa and from Uncle Scottie. Her dad, Kenny, took about an hour to assemble Barbie’s three story high apartment house; Alex figured out how to assemble Barbies Camper Bus all by herself. She had, of course, candy. A woolen hat all the way from Scotland and many other toys, most of which stay at Grandma and Grandpa’s and clutter up the living room. She has too many toys! Holy smokes, Lyle! Great story. We love ‘em! Drop us a note with your thoughts to: thepaper@cox.net We want to hear your thoughts; so do your neighbors and fellow readers! She is being spoiled rotten and I don’t approve of it. She’s as cute as can be but she gets, and has come to expect, huge collections of gifts. I just don’t think that’s right. But I keep my yap shut. I contribute to that which I disapprove by giving my credit card to my wife and eldest son, telling them to get whatever they think Alex would like and charge it to my account. They came back with Barbie’s huge 3story house. At one point I suggested that we take a lot of her old toys (most of which are relatively new and all of which add to the clutter of Grandma and Grandpa’s living room) and give them to children who don’t have a daddy, or a mommy, or are poor. Nope, they’re hers. I don’t like that either. I would like to see her develop some compassion for others. I love her . . . but don’t like the direction she’s going in terms of being spoiled. Problem is, her dad absolutely adores her, as does mom. As do grandma and grandpa, and Uncle Scottie. We all want her to be happy but I think we go overboard. I reckon Santa ought to bypass Alex’s house tonight and give toys otherwise destined for her to kids who need it more . . . and who would likely appreciate it more. for Back Pain, Neck Pain, Hip Pain, Knee Pain or Scoliosis !! !! ! ! ! ! ! ! ! ! ! ! it’s time for you to find out if Postural Biophysics can help your scoliosis, back or neck pain. For 14 days only, $27 will get you all the services I normally charge new patients $245 for! Take a look at what you will !receive… An in-depth consultation about your health and well-being where I will listen … really listen… to the details of your case. A postural evaluation for your muscular imbalance. Two specialized x-rays ($27) to determine the extent of your scoliosis. A thorough analysis of your exam and x-ray findings so we can start mapping out your plan to being pain free. Don’t forget, this special offer is valid only for the next 14 days. the Red Army Academy to become a full-fledged NKVD espionage operative. After six years of introductory spy work in Moscow and Paris, he was finally sent to Brussels in 1938 to establish an advanced spy network against the Third Reich. This inadvertently allowed Trepper to escape Stalin’s Great Purge which claimed the lives of over 40,000 Red Army personnel, including two of his Academy mentors. Abwehr activity. His actual mission which preoccupied most of his time was to hunt down The Big Chief and his fellow Soviet pianists at all costs, due to their deep penetration into highranking, Nazi military circles like the German General Staff which contained all of Hitler’s top Wehrmacht generals. The Orchestra network managed to evade capture from 1938-1941 due to their expert leadership from Trepper, but were eventually betrayed by one of their own; a Jewish maid from Germany named Rita Arnould who served as a mistress and housekeeper for one of the Orchestra’s pianists. Fortner and his own team of ingenious Abwehr officials eventually managed to track down and raid one of the Soviet safe houses in Brussels, using advanced radio wave tracking technology from the Hermann Goering Research Institute. Arnould inadvertently revealed during intense interrogation by Fortner’s team that an extremely rare French book from 1910 with limited publication, The Miracle of Professor Wolmar, was the source key being used by the Soviet spies to encode their messages. As successful as the Orchestra was in providing the information that would eventually destroy the Third Reich, their glories were to be short-lived. Realizing the severity of Stalin’s espionage activity after tracing Soviet radio transmissions from Europe to Moscow, the Gestapo sent Captain Franz Fortner (a journalistic pseudonym from Perrault for protection against Soviet reprisal), a former WWI veteran of Verdun who had led a Panzer tank division at the siege of Dunkirk, to eliminate the Red Orchestra in Brussels. Easy, Safe & Effective! ! Are you or someone you love overweight, at risk for high blood pressure, high cholesterol, heart disease or diabetes? For more than 60% of adults in this country, the answer is yes. GET BACK TO A SLIMMER YOU! Hi, My name is Dr. Hoon Lim, D.C. and I won the weight loss battle and have helped my patients do the same, without drugs or surgery. And now I’d like to help you. So if you’re concerned about your weight, please find out how we can help you lose 15~30 lbs. without exercise in one month. You will learn, with no obligation, all about how YOU can achieve and maintain your ideal weight so easily. de Teramond novel in a secondhand bookstore, using the text to reverse engineer and decipher the Soviet codes. Cracking the codes was an operational goldmine, leading them to the location of roughly half of the Red The operatives. Orchestra cunning Jewish Old Guard were enough to slip out of German hands, with Trepper, Grossvogel and Katz surviving the war. Russian Young Guard member Anatoli Gurevich also managed to narrowly escape the Nazi guillotine. “The Big Chief” was naturally repaid for his patriotic efforts after returning to Moscow at the war’s end in 1945, suffering internment as a Gulag inmate for nearly ten years. After his release from the Gulag system in 1955, Trepper returned to his native Poland and eventually made his way to Israel after anti-Semitism experiencing from the ruling Soviet authorities. He released his own personal memoirs in 1975, entitled The Great Game, detailing the intricate firsthand history of the world’s greatest spy network. Other members of the Orchestra were not so lucky. The naïve, albeit incredibly brave Mikhail Makarov was captured by the Nazis, tortured and eventually executed without revealing any damning information. The same happened to hardened French Suzanne agent Resistance Spaak along with the fatalistic, maid-turned-Nazi collaborator Rita Arnould. To Fortner’s credit as an honorable German officer, he offered to break Nazi law by smuggling Rita Arnould to Spain on a tangential Abwehr mission of his to the Basque city of San Sebastian. Arnould declined Fortner’s secret offer to free her, since she knew her status as an informant against the USSR meant the Soviet NKVD would hunt her to the ends of the earth even if she escaped the Nazis’ wrath. Man About Town Cont. from Page 4 But that won’t happen. Santa tends to be pretty generous as well. Fast forward to last week. Starter on my car seemed to be hesitant; on one occasion I had to hit the ignition three times before it would start. Decided to take it back to the nice folks at Escondido Auto Tech. Sure enough, they found that my starter needed to be replacedf and I gave them the green light to go ahead. On that very same day my partner, Evelyn Madison, had a rattle in her late model Hyundai. She had stopped at Hyundai but they were too busy to even take a look at the car. She knew of my pleasant experience at Escondido Auto Tech so took her car there. Same guy, Frank Caratachea, put the car up on a hoist, found a couple of loose nuts, tightened them up, and brought car back down. “How much do I owe you?” asked Evelyn. Again, he waved her off. “No big deal. Merry Christmas. No charge. Have a great day.” Any idea where we’re taking our cars from now on when we need servicef? Thes guys, Frank, and the owner, Jim Isch, have been working together for nigh on to 30 years. No wonder they’ve survived so long. Great customer service and top notch mechanical diagnostics and service. Very, very pleased. The Legislature is half-way through its 2017-2018 session. But work has continued since recess began in September. I am a member of 11 select committees, and most have continued to meet and hold hearings. Important issues that are sometimes put on the back burner during the regular session can be discussed in detail by select committees during recess. I am Vice Chair of the Assembly Rules Subcommittee on Harassment, Discrimination and Retaliation Prevention & Response, which recently held a lengthy hearing in Sacramento to gather information about current processes and areas needed for improvement to protect victims and hold violators accountable. but she argued and said she was going to take some aspirin and go to bed, and there was no need for his good time being spoiled by not going. So he took his costume and away he went. The wife, after sleeping soundly for about an hour, awakened without pain and, as it was still early enough, decided to go to the party. Since her husband did not know what her costume was, she thought she would have some fun by watching her husband to see how he acted when she was not with him. She joined the party and soon spotted her husband cavorting around on the dance floor, dancing with every nice woman he could, and copping a little touch here and a little kiss there. His wife sidled up to him and, being a rather seductive babe herself, he left his current partner high and dry and devoted his time to the new babe who had just arrived. She let him go as far as he wished . . . naturally, since he was her husband. Just before unmasking at midnight, she slipped away, went home, put the costume away, and got into bed, wondering what kind of explanation he would make for his behavior. She was sitting up reading when he came in, and she asked what kind of a time he had. age, access to care and uninsured rates. The Select Committee on Infectious Disease in High Risk Disadvantaged Communities also met to discuss viral load suppression, medication adherence and goals for HIV/Aids patients in Riverside/San Bernardino. Select Committees on Regional Transportation Solutions, Waste Reduction and Recycling, and important for our district, the Wine committee, are all working during recess. My six standing committees, which will resume after we reconvene January 3rd, are Governmental Organization, Health, Rules and Ethics. And I’m Vice Chair of both Local Government, and the Arts, Entertainment, Sports, Tourism & Internet Media Committees. I’m looking forward to a busy 2018, serving as your representative in Sacramento. Minority Floor Leader Marie Waldron, R-Escondido, represents the 75th Assembly District in the California Legislature, which includes the communities of Bonsall, Escondido, Fallbrook, Hidden Meadows, Pala, Palomar Mountain, Pauma Valley, Rainbow, San Marcos, Temecula, Valley Center and Vista. He said: "Oh, the same old thing. You know I never have a good time when you're not there." "Did you dance much?" Spotted in a safari park: (I certainly hope so) ELEPHANTS PLEASE STAY IN YOUR CAR Seen during a conference: FOR ANYONE WHO HAS CHILDREN AND DOESN'T KNOW IT, THERE IS A DAY CARE ON THE 1ST FLOOR Notice in a farmer's field: THE FARMER ALLOWS WALKERS TO CROSS THE FIELD FOR FREE, BUT THE BULL CHARGES. and pressed, I had a roof over my head, I had HDTV and Internet, and I went to the gym, the pool, and the library. "I was working on my MBA on-line. I had no bills and no debt. I even had full medical coverage." Two men were talking. One had just had plastic surgery. The other said to him, "You know that plastic surgery is really a wonderful thing. They can take skin from one part of your body and graft it on in another place. That is really something and you have no after effects. Isn't that wonderful?! The other man said, "Yes, it is an amazing thing. Yes, they took skin from one part of my body and grafted it on another, but I do have an aftereffect. AT AN OPTOMETRIST’S OFFICE: "If you don't see what you're looking for, you've come to the right place." On an Electrician's truck: "Let us remove your shorts." At a Car Dealership: "The best way to get back on your feet – miss a car payment." In a Veterinarian's waiting room: "Be back in 5 minutes. Sit... Stay..."
At the Electric Company: "We would be delighted if you send in your payment on time However, if you don't, YOU will be de-lighted. In the front yard of a Funeral Home: "Drive carefully. We'll wait." In a Chicago Radiator Shop: "Best place in town to take a leak." Earhart and Putnam secured additional funds and prepared for a second attempt. This time flying west to east, the second attempt began with an unpublicized flight from Oakland to Miami, Fla. On this second attempt, Earhart and Noonan departed Miami on June 1, and after numerous stops in South America, Africa, the Indian subcontinent and Southeast Asia, arrived at Lae, New Guinea, on June 29, 1937. At this stage about 22,000 miles of the journey had been completed. The remaining 7,000 miles would be over the Pacific to California. I felt sorry for him, so I asked, "What Alcohol? Drugs? happened? Divorce?" Every time I get tired, my face wants to sit down." ••••• A SIGN IN A SHOE REPAIR STORE IN VANCOUVER THAT READ: "We will heel you We will save your sole We will even dye for you." The Mysterious Disappearance of ‘Lady Lindy” Perhaps no other adventurer has captured the imaginations around the world than American aviatrix Amelia Earhart, who was a world-renowned flyer that was lost somewhere in the Central Pacific during an attempt to fly around the world. Amelia Mary Earhart, born July 24, 1897; disappeared July 2, 1937. She was an aviation pioneer and author. Earhart was the first female aviator to fly solo across the Atlantic Ocean, which at that time, was the equivalent of going to the moon. She received the U.S. Distinguished Flying Cross. She set many other records, wrote best-selling books about her flying experiences and was instrumental in the formation of The Ninety-Nines, an organization for female pilots. Trading on her physical resemblance to famed aviator Charles Lindbergh, whom the press had dubbed "Lucky Lindy", some newspapers and magazines began referring to Earhart as "Lady Lindy.” During the same period, Earhart and publisher George P. Putnam had spent a great deal of time together. Putnam, who was known as GP, was divorced in 1929 and sought out Earhart, proposing to her six times before she finally agreed to marry him. After substantial hesitation on her part, they married on Feb. 7, 1931. In 1937, during an attempt to make a circumnavigational flight of the globe, Earhart disappeared over the central Pacific Ocean near Howland Island. Fascination with her life, career and disappearance continues to this day. Dozens of amateur and professional researchers and archeologists have spent years hunting for the answer to her disappearance. Through contacts in the Los Angeles aviation community, Fred Noonan was subsequently chosen as a second navigator. He had vast experience in both marine and flight navigation. On March 17, 1937, Earhart flew the first leg from Oakland, Calif, to Honolulu, Hawaii. Upon take off at the Navy’s Luke Field for the second leg of her trip from Honolulu to Howland Island, she crashed before liftoff. Some observers, including an Associated Press journalist, said they saw a tire blow. Earhart thought either the Electra's right tire had blown and/or the right landing gear had collapsed. Some sources cited pilot error. With the aircraft severely damaged, the global flight attempt was called off and the aircraft was shipped by sea to the Lockheed Burbank facility for repairs. Many researchers believe Earhart and Noonan simply ran out of fuel while searching for Howland Island, ditched at sea, and perished. Earhart had radioed the Itasca, a U.S. Coast Guard cutter anchored off Howland Island. She estimated they were 200 miles away from Howland. As Earhart’s plane came closer to Howland, she expected to be in radio contact with the Itasca, which was waiting to refuel Earhart’s plane. With radio contact, she would have been able to use a radio direction finding receiver to head directly for the Itasca and Howland. But, apparently the plane was not receiving any radio signals from the ship. Rear Admiral Richard R. Black, USN, who was in charge of the Howland Island airstrip and was present in the radio room on the Itasca, asserted in 1982 "the Electra went into the sea about 10 am, July 2, 1937, far from Howland.” British aviation historian Roy Nesbit interpreted evidence in contemporary accounts and Putnam's correspondence and concluded Earhart's Electra was not fully fueled at Lae, New Guinea. Another long-held theory is that Earhart and Noonan were captured by Japanese armed forces, which inhabited many of the South and Central Pacific islands. In 1990, the NBC-TV series Unsolved Mysteries broadcast an interview with a Saipanese woman who claimed to have witnessed Earhart and Noonan's execution by Japanese soldiers. As late as 2017, a somewhat blurry black and white photo emerged and was purported to be a man and woman being loaded onto a Japanese ship in the late 1930s. However, no confirmation has been found. A recent proponent of the Japanese theory is author Mike Campbell, who cites claims from Marshall Islanders to have witnessed a crash, as well as a U.S. Army Sergeant who found a suspicious gravesite near a former Japanese prison on Saipan, hundreds of miles of north from Earhart’s flight route. To this day, the 1937 air-sea search Earhart and Noonan was the largest in history. Earhart's accomplishments in aviation inspired a generation of female aviators, including the more than 1,000 women pilots of the Women Airforce Service Pilots (WASP) who ferried military aircraft, towed gliders, flew target practice aircraft, and served as transport pilots during World War II. The home in Atchison, Kan., where she was born is now the Amelia Earhart Birthplace Museum and is maintained by The Ninety-Nines. The search for the fate of Earhart and her navigator Fred Noonan continue to fascinate aviation history buffs. omes with 1 lb. of Carne a, 1 lb. of Rice & Beans, an . Salsa & 1 Dozen Tortillas. Tortillas. Comes with 2 lbs. of Carne Asada, 2 lbs. of Rice & Beans, an 2 lbs. Salsa & 3 Dozen Tortillas.
) 746-3693 • Openn 7 Days 8AM-9PM Join Us Here Every Week and Check out the Area Restaurants! Lots of great bargains, coupons . . . and plenty of great food and atmosphere! Whether going out for a formal evening’s dining, or a casual get together, it’s all here! Would you like to work with/for The Paper? Job openings include sales, drivers (to deliver The Paper) and, possibly, writers. Drop us a note at: thepaper@cox.net Who knows? You might find a whole new career! while learning SOUL line dances choreographed to your favorite R&B jazz, gospel and Latin tunes. No experience or partner required. Beginner and experienced dancers encouraged. Cost is $33 for Vista residents, $39 for non-residents. One class passes are also available for $12/Vista resident, $14/non-resident. Reserve online at www.gmacvista.com or call 760.643.5281. Pre-registration is required. Center to Hold Ballroom Dance “ChaCha-Cha” - The Gloria McClellan Center will hold a Ballroom Dance Class featuring the Cha-Cha-Cha on Wednesdays, January 10-31, from 7–8pm at 1400 Vale Terrace Drive in Vista. Cost is $35/4 classes for Vista residents or $42 for non-residents. Pre-registration is required. Register online at www.gmacvista.com or call 760-643-5281.
grams, visit the Library’s website at library.escondido.org or contact Children’s Librarian Kristine Macalalad at 760-8395458 or kmacalalad@escondido.org. The Library is located at 239 S. Kalmia St., Escondido. VCHS Musical “The Addams Family” Tickets on Sale Now – Valley Center High School Musical theater tickets are on sale now for “The Addams Family” musical. The musical is based on Charles Addam’s beloved characters, endeared by the TV show of the same name that ran in the mid1960’s. Performances will be held at 7pm on January 12th, 13th, 19th, and 20th; at 2:30pm on January 13th and 14th, at the Maxine Theatre at 31322 Cole Grade Road, Valley Center. Tickets are $12/person or $10/groups of 4 or more, and on sale through the Maxine Theatre website, www.maxine.vcpusd.org, or from cast members. All are welcome. “Rhythms & Ripples” Concert on January 14th – The First Congregational Church of Escondido, 1800 North Broadway, Escondido 92026, will have a concert on January 14th at 3pm. ’Rhythms & Ripples’, presented by the Wind Spring Quintet, featuring Becky Dominguez on Flute, Gerry Lester on Oboe, Rebecca Frybarger on Clarinet, Eric Gripp on French Horn, and Cheryl Knapp on Bassoon, with Guest Musician Emily Just on Percussion. The Quintet will feature light classical, popular, and folk music. Everyone is invited to share refreshments, coffee, juice, and appetizers after the concert. There will be a free will offering. Visit the website for more info, www.fcceonline.org or call 760.745.3320.
and the Wolf ” by Sergei Prokofiev and “Morceau de Concert” for harp and strings by Camille Saint-Saëns with harp soloist, Stefan Wendel. The Players are directed by Daniel Swem. The concert will be at the Schulman Auditorium at the Carlsbad Dove Library on Sunday, January 21, at 2:30pm. Admission is free, donations accepted. Funded, in part, by the City of Encinitas and the Mizel Family Foundation. Happy Holidays from Escondido Chamber – The Escondido Chamber of Commerce wishes you and your family a Merry Christmas and Happy New Year. The Chamber will be closed thru January 1st; will open on Tuesday, January 2nd. Happy Holidays! Happy Holidays from San Diego Archaeological Center – The Board of Trustees and staff of the San Diego Archaeological Center wish you and your family a happy and safe holiday season, and hope that the New Year brings you good health, happiness and prosperity. We look forward to spending our Silver Anniversary with our loyal supporters and friends. More to come on our milestone year – see you in 2018! There’s still time to make a year end donation. Please consider making a donation to the Center for our Annual Appeal Campaign, which is critical in helping us to fulfill our mission to preserve pieces of the past to tell the stories of people who have called this region home for thousands of years. The Center curates millions of artifacts and shares them with the public through research, exhibition and public education. Please help us continue to preserve history by making a tax-deductible donation, and you may indicate how you want your contribution to be used. Donations may be made online, by phone to Cindy Stankowski at 760.291.0370, email cstankowski@sandiegoarchaeology.org or by mail to the Center, Attn: Development Dept., 16666 San Pasqual Valley Road, Escondido, 92027. Women’s Foundation Raises $6,000 for Just In Time Foster Youth - The San Diego Women’s Foundation (SDWF), a nonprofit organization dedicated to educating and inspiring women to engage in collective philanthropy, raised $6,000 for Just in Time for Foster Youth. Social Butterfly Cont. from Page 9 on making and selling soap and candles from goat’s milk. The troop raised the money by asking for donations and by selling a small bucket which contained a washcloth and three bars of soap and a candle made with goat’s milk. The $800 donated will go to Heifer International, to buy seven goats. Heifer International is an organization the Woman’s Club of Vista has supported for several years. This year at the convention of General Federation of Women’s Clubs (GFWC), the Woman’s Club of Vista President Judy Pantazo was given the Heifer Hope award, recognizing her strong support and promotion of Heifer International. Frances Hale and Jill Kilty Newburn from Heifer International and California Federation of Women’s Clubs (CFWC) International Outreach Chairman Carol Spiker presented the award. Selena is pet of the week at your Rancho Coastal Humane Society. She’s a 5 year old, 12 pound, Domestic Short Hair with a Torbie coat. That’s Tortoiseshell and Tabby. She’s a perfect combination of independent and affectionate. She’s okay on her own, but she’s happy to snuggle when you have time to love on her. Selena was transferred to Rancho Coastal Humane Society from another shelter through the FOCAS program. The $100 adoption fee for Selena includes medical exam, vaccinations, spay, and microchip. For more information call 760-753-6413, visit Rancho Coastal Humane Society at 389 Requeza Street in Encinitas, or log on to SDpets.org. This entire year was a blur. If I think back, there are significant milestones that seem distant now. Tuo Tuo, a 1-year-old American mix guinea pig, is looking for a new home. This sweet little fella loves to be active, so having some space to run and play would be a great fit for him. He can be a bit shy at first, but with lots of gentle pets, he warms up quickly. His adoption fee includes his permanent microchip identification and a certificate for a free veterinary exam! Tuo Tuo is available for adoption at the San Diego Humane Society’s Escondido Campus at 3450 E Valley Parkway. To learn more about making him part of your family, please call (760) 888-2275.
implement standardized testing for political candidates. Locally, Escondido city council voted to outsource the public library to a questionable company under suspicious circumstances. We are being sued about it now. The council also resolved the country club development issue by allowing a compromise plan to move forward. We are being sued about that too, again. Let’s hope 2018 will bring resolutions and fewer legal entanglements. There is no “do over” but there is always a “do better”. open to all. April 21 – Earth Day Festival free event, from 10am-3pm, children’s nature activities, music and dance, vendors, plant sale, take-home compost in a bottle. June 9 – Veggie Critters; create your own creatures using vegetables and fruits and your imagination. July 14 – Birds, Nests and Feathers; learn about our feathered friends and their special adaptations that help them survive. August 11 – Water, Water, Everywhere; how do we use water? How can we save water? How can we have fun with water? September 8 – Recycled Art; make creative projects using “saved” trash. October 20 – Fall Fun Festival free event, from 10am-3pm, scarecrow contest, pumpkins, bobbing for apples, children’s fall crafts, vendors, plant sale, BBQ lunch for sale. December 8 – Stone Soup and Breadsticks; share the story, make the soup, and roll out breadsticks. Classes are on Saturdays from 10am to 12noon (unless otherwise noted). Pre-registration requested; $5 each child or adult. Contact Farmer Jones, 760.822.6824, or farmerjonesavbg@gmail.com. For monthly reminders, send your email to Farmer Jones. Pastor Tom Fry, Retired Church of the Nazarene When is Christmas over? When I was a kid, we got to keep our opened Christmas presents under the tree for a few days. That was cool. Games, books, a new football, didn’t have to be put away until the Christmas tree came down. That was the sign, in our house, that Christmas was over. And the new toys, books, and games had to be put away with the old stuff. Jesus came to stay. He came to live in the neighborhood. To remain with us. There’s a hymn we sing at Easter that could really be a Christmas Carol: He lives, He lives, Christ Jesus lives today! He walks with me and talks with me along life's narrow way. He lives, He lives, Salvation to impart! You ask me how I know He lives? He lives within my heart. Christmas isn’t over. He dwelt among us, he came to stay, and he lives within us. Did you know that holiday trees cause about 200 fires annually that result in deaths, injuries and millions of dollars in property damage? family get-togethers, parties, gift exchanges and holiday decorations, Americans produce approximately 25% more waster between Thanksgiving and New Years Day. Personal Attention 6.5, and then installed undesirable programs such as: NBA 5.0, NFL 3.0 and Golf 4.1.
mary, Husband 1.0 is a great program, but it does have limited memory and cannot learn new applications quickly. You might consider buying additional software to improve memory and performance. We recommend Cooking 3.0. Good Luck! A nice story - the elderly are beautiful. God bless you for the beautiful radio I won at your recent senior citizens luncheon. I am 84 years old and live at the Sprenger Home for the Aged. All of my family has passed away. I am all alone now and it's nice to know that someone is thinking of me. God bless you for your kindness to an old forgotten lady. My roommate is 95 and has always had her own radio, but before I received one, she would never let me listen to hers, even when she was napping. (523 S. Santa Fe Avenue) and (2) the parking lot on the corner of S. Melrose & Shadowridge drives. For more information, residents should contact EDCO at 760.727.1600. Did you know Vista residents can drop off used motor oil and filters at the HHW facility located at 1145 E. Taylor Street? Antifreeze, auto batteries, paint, pesticides, home-generated sharps, and other HHW can be dropped off. The facility is open to Vista residents; proof of residency is required. No appointment is necessary and there is no direct fee to the resident. The facility is open from 9 a.m. to 3 p.m. on Saturdays (closed on holiday weekends). I have made the difficult decision to resign my position as Mayor of the City of Oceanside, effective January 1, 2018, due to health reasons. The City council will have sixty days to fill my position by appointment or, if necessary, call an election for the voters to select a successor to fill my remaining term. been such an honor to serve the City that I have lived in for over 65 years; as a Police Officer, a Councilmember and Mayor. The rabbi looked at the priest with a big grin, and said, "At your wedding." One Sunday morning, a mother went in to wake her son and tell him it was time to get ready for church, to which he replied, "I'm not going." "Why not?" she asked. I'll give you two good reasons," he said. "(1), they don't like me, and (2), I don't like them." A Jewish Rabbi and a Catholic Priest met at the town's annual 4th of July picnic. Old friends, they began their usual banter. "This baked ham is really delicious," the priest teased the rabbi. "You really ought to try it. I know it's against your religion, but I can't understand why such a wonderful food should be forbidden! You don't know what you're missing. You just haven't lived until you've tried Mrs. Hall's prized Virginia Baked Ham. Tell me, Rabbi, when are you going to break down and try it?" An elderly woman walked into the local country church. The friendly usher greeted her at the door and helped her up the flight of steps. "Where would you like to sit?" he asked politely. "The front row, please," she answered. "You really don't want to do that," the usher said. "The pastor is really boring." "Do you happen to know who I am?" the woman inquired. "No," he said. "I'm the pastor's mother," she replied indignantly. "Do you know who I am?" he asked. "No," she said. The Paper • Page 12 • December 28, 2017 rent of whiskey laced profanity. “I picked that dang thing up at the cleaners fer my nephew. He puts it on every Christmas and his brats is stupid enough fall fer it every time. Makes me sick just thinking bout it.” We walked into the shop and Jack headed straight for the coffee pot. “I come to town to git one of them 27 inch Viewsonic monitors they’s practikly givin away at Fry’s. I Got me the last one,” he croaked triumphantly. It was Christmas Eve 2008 near closing time. I was carrying a PC to the car for a lady when “Cactus Jack Trosper” pulled up his red Ford pickup truck. On each fender there were huge chrome foghorns that tooted out the refrain from “Dixie” as he came to a stop. In the center of the hood was a five-foot spread of “Texas longhorns.” I noticed a Santa suit draped over a huge box in the front seat. “Hey Jack, I see you got yourself a Santa suit. You moonlighting at the mall?” I laughed. Serving all of North County Our Mission: To provide families with the best possible service at prices affordable by all. CREMATIONS $415 WHY PAY MORE? If So . . . let’s talk. A kindergarten teacher gave her class a "show and tell" assignment. Each student was instructed to bring in an object that represented their religion to share with the class. The first student got up in front of the class and said, "My name is Benjamin and I am Jewish and this is a Star of David." The second student got up in front of the class and said, "My name is Mary. I'm a Catholic and this is a Rosary." A priest, a minister and a guru sat discussing the best positions for prayer, while a telephone repairman worked nearby "Kneeling is definitely the best way to pray," the priest said. First day of business n/a. Clerk/Recorder of San Diego County on 11/28/2017. 12/28/2017, 1/04, 1/11 & 1/18/2018. 184 Paseo Marguerita, Vista, Ca. 92084. First day of business was 12/18/2017. Clerk/Recorder of San Diego County on 12/18/2017. Mesa Blvd., San Diego, Ca. 92117. Specializing in short and long term care assistance for all ages, with all activities of daily living, in your home. Drive to/from doctor appointments, new mommy assistance/infant care, Alzheimer patient care, general assistance before/after surgery, respite care for parents of disabled children, and much more. Rates Start at $22 per per Rates start at $16.00 hour for companion services. Clerk/Recorder of San Diego County on 12/22/2017. First day of business was 5/01/17. Commercial/Residential Additional circuits/Lighting Troubleshooting/Repairs 760-402-7802. #2017-9030743 The name of the business: Blossom Landscape, located at 1450 Heidi Circle, Vista, Ca. 92084. This business is registered by Benancio Careno-Bueno 1450 Heidi Circle Vista, CA. 92084 This business is conducted by an individual. First day of business was n/a. /s/ Benjancio Carreno-Bueno Filed with Ernest J. Dronenburg Jr., County Clerk/Recorder of San Diego County on 12/19/2017. 12/28/2017, 1/04, 1/11 & 1/18/2018. #2017-9029633 The name of the business: All By Design, located at 1450 Hedionda Ave., Vista, Ca 92081. This business is registered by: Micwood Enterprises, Inc. 1450 Heidonda Ave. Vista, CA. 92081 This business is conducted by a corporation. First day of business was 2/6/2015. /s/ Michelle Wood, President Filed with Ernest J. Dronenburg Jr., County Clerk/Recorder of San Diego County on 12/06/2017. 12/21, 12/28/2017 and 1/04 & 1/11/2018. the California Courts Online Self-Help Center. www.courinfo.ca.gov/selfhelp), at the California Legal Services Website (www.lawhelpcalifornia.org), or by contacting your local county bar association. NOTICE: The restraining orders below are effective against both spouses or domestic partners until the petition is dismissed, a judgment is entered, or the court makes further orders. These orders are enforceable anywhere in California by any law enforcement officer who has received or seen a copy of them. NOTICE TO THE PERSON SERVED: You are served as an individual. Starting immediately, you and your spouse or domestic partner are restrained from: 1. Removing the minor children of the parties from the sate or applying for a new or replacement passport for those minor children without the prior written consent of the other party or an order of the court. 2. cashing, borrowing against, canceling, transferring, disposing of, or changing the beneficiaries of any insurance or other coverage, including life, health, automobile, and disability, held for the benefit of the parties and their minor children; 3. transferring, encumbering, hypothecating, concealing, or in any way disposing of any property, real or personal, whether community, quasi-community, or separate, without the written consent of the other party or an order of the court, except in the usual course of business or for the necessities of life, and; 4. creating a nonprobate transfer or modifying a nonprobate transfer in a manner that affects the disposition of property subject to the transfer, without the written consent of the other party or an order of the court. Before revocation of a nonprobate transfer can take effect or a right of survivorship to property can be eliminated, notice of the change must be filed and served on the other party. 1. The name and address of the court are SUPERIOR COURT OF CALIFORNIA 325 S. Melrose Dr., Vista, CA. 92081. You have 30 calendar days after this Summons and Petition are served on you to file a Response (form FL-120) at the court and have a copy served on the petitioner. A letter or phone call will not protect you. First day of business was n/a. Clerk/Recorder of San Diego County on 11/30/2017. 12/07, 12/14, 12/21 & 12/28/2017. #2017-9028077 The name of the business: Connecting-Life’s-Dots, located at 650-315 S. Rancho Santa Fe Rd., San Marcos, CA. 92078. This business is registered by: Lucy Josephine Wheeler 650-315 S. Rancho Santa Fe Rd. San Marcos, Ca. 92078 This business is conducted by an individual. First day of business was n/a. /s/ Lucy Josephine Wheeler Filed with Ernest J. Dronenburg Jr., County Clerk/Recorder of San Diego Couunty Diego County on 11/15/2017. 12/07, 12/14, 12/21 & 12/28/2017. #2017-9028712 The name of the business: Center for Stress Recovery and Resilience, located at 2111 S. El Camino Real #302, Oceanside, CA. 92054. This business is registered by: Denise Kruszewski, PHD, Psychology Inc. 2111 S. El Camino Real #302 Oceanside, CA. 92054 This business is conducted by a corporation. First day of business was n/a. /s/ Denise Kruszewski, CEO Filed with Ernest J. Dronenburg Jr., County Clerk/Recorder of San Diego County on 11/21/2017. 12/07, 12/14, 12/21 & 12/28/2017. #2017-9029041 The name of the business: Vistacab, located at 4483 Brisbane Way, #5, Oceanside, CA. 92058. This business is registered by: Masoud Karimian 4483 Brisbane Way #5\Oceanside, CA. 92058 Salih Gultoprak 12610 Torrey Bluff Dr. #376 San Diego, Ca. 92130 This business is conducted by co-partners. First day of business was 10/06/2017. /s/ Masoud Karimian Filed with Ernest J. Dronenburg Jr., County Clerk/Recorder of San Diego County on 11/28/2017. 12/07, 12/14, 12/21 & 12/28/2017. #2017-9028726 The name of the business: California Coastal Outdoor Services, located at 449 E. 11th Ave., Escondido, CA. 92025. This business is registered by: Donald Matthew Long 449 E. 11th Ave. Escondido, CA. 92025 This business is conducted by an individual. First day of business was 11/15/17. /s/ Donald Matthew Long Filed with Ernest J. Dronenburg Jr., County Clerk/Recorder of San Diego County on 11/222017. 12/07, 12/14, 12/21 & 12/28/2017. #2017-9030673 The name of the business: VeggyJess, located at 1781 Felicita Ln. Vista, Ca. 92083. This business is registered by: Jessica Jeanette Castillo 1781 Felicita Ln. Vista, Ca. 92083 This business is conducted by an individual. First day of business was n/a. /s/ Jessica Jeanette Castillo Filed with Ernest J. Dronenburg Jr., County Clerk/Recorder of San Diego County on 12/19/2017. 12/21, 12/28/2017 & 01/04 and 01/11/2018. TV, Internet, Phone and Cell Phone Experts Save on TV, Internet, Phone and Cell Phone Costs! 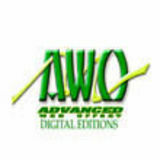 Top grade printing of all types, brochures, letterhead, posters banners, business cards. #2017-9028271 The name of the business: Surfside Tropicals, located at 2929 Fairview Dr. Vista, Ca. 92084. This business is registered by: Michael Martino 2929 Fairview Dr. Vista, Ca. 92081 This business is conducted by an individual. First day of business was 5/01/08. /s/ Michael Martino Filed with Ernest J. Dronenburg Jr., County Clerk/Recorder of San Diego Couunty Diego County on 11/16/2017. 11/23, 11/30, 12/07 and 12/14,2017. Scarlet Place, San Marcos, CA. 92069. Clerk/Recorder of San Diego County on 11/20/2017. changing names as follows: Present name: Pamela Denise Machala to Proposed name Pamela Denise Gamly. court may grant the petition without a hearing. NOTICE OF address of the court is: 330 W. Broadway, San Diego, CA. First day of business was 11/29/17. J. #2017-9030292 The name of the business: Slater’s 50/50 Restaurant, located at 110 Knoll Road, San Marcos, CA. 92069. This business is registered by: W. M. Moya, Inc. 36130 Agape Lane Wildomar, Ca. 92595 This business is conducted by a corporation. First day of business: n/a. /s/ Wilfred Moya, President Filed with Ernest J. Dronenburg Jr., County Clerk/Recorder of San Diego County on 12/13/2017. 12/21, 12/28/2017, 01/04 & 01/11/2018. #2017-9030195 The name of the business: The Learning Experience, located at 4174 Avenida de la Plata, Oceanside, CA. 92056. This business is registered by: Kid’s Pedagogy LLC 402 Paseo Del Concho San Marcos, CA. 92078 This business is conducted by a Limited Liability Company. First day of business: n/a. /s/ Trushark Kumar Patel, Treasurer Filed with Ernest J. Dronenburg Jr., County Clerk/Recorder of San Diego County on 12/12/2017. 12/21, 12/28/2017, 01/04 & 01/11/2018. #2017-9030502 The name of the business: California Real Estate Professional, located at 3533 Roselle Ave., Oceanside, CA. 92056. This business is registered by: Betty Jeanne Calkin 3533 Roselle Ave. Oceanside, CA. 92056 This business is conducted by an individual. First day of business was 10/10/2017 /s/ Betty Jeanne Calkin Filed with Ernest J. Dronenburg Jr., County Clerk/Recorder of San Diego County on 12/15/2017. 12/21, 12/28/2017, 01/04 & 01/11/2018. San Marcos, Ca. 92078. Dated 12/19/2017. #2017-9028054 The name of the business: Good Wood Millworks, located at 1835 Rock Springs Road, San Marcos, Ca. 92069. This business is registered by: Richard Andrew Trusty 360 Benevente Dr. Oceanside, CA. 92057 This business is conducted by an individual. First day of business was n/a. /s/ Richard Andrew Trusty Filed with Ernest J. Dronenburg Jr., County Clerk/Recorder of San Diego County on 11/15/2017. 12/07, 12/14, 12/21 & 12/28/2017. 640 E. Vista Way, Ste B, Vista, Ca. #2017-9029573 The name of the business: First Choice Inspections, First Choice Drone & Media, located at 37846 Bear View Circle, Murrieta, CA. 92562. This business is registered by: Stenros Enterprises, Inc. 37846 Bear View Circle Murrieta, CA. 92562 This business is conducted by a corporation. First day of business was 1/14/2000. /s/ Stephen William Stenros, President Filed with Ernest J. Dronenburg Jr., County Clerk/Recorder of San Diego County on 12/05/2017. 12/14, 12/21, 12/28/2017 & 01/04/2018. #2017-9030557 The name of the business: HOM Escrow, A Non-Independent Broker Escrow, located at 9988 Hibert St., 150, San Diego, CA. 92131. This business is registered by: San Diego Homes & Estates, Inc. 9988 Hibert St. 150 San Diego, CA. 92131 This business is conducted by a corporation. First day of business: n/a. /s/ Rich Johnson, President Filed with Ernest J. Dronenburg Jr., County Clerk/Recorder of San Diego County on 12/18/2017. 12/21, 12/28/2017, 01/04 & 01/11/2011.